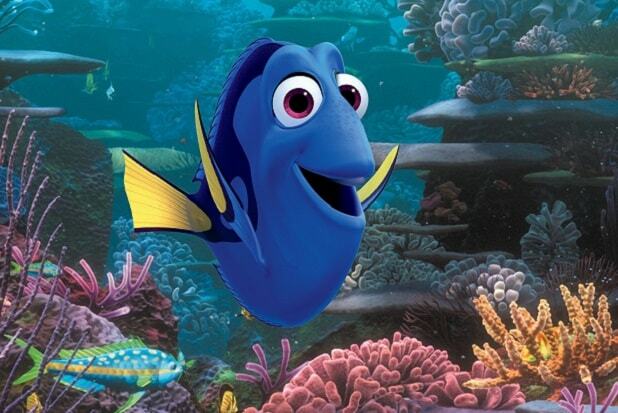 Early prognosticators are projecting a massive $125 million opening for “Finding Dory” at this weekend’s box office. A big opening would break a trend of lackluster sequels this year. Fox’s “X-Men” sequel, Paramount’s “Teenage Mutant Ninja Turtles” followup, and Lionsgate-Summit’s latest film in the “Divergent” series have all been touched by the 2016 sequel slump — none have surpassed the opening weekend grosses of the films that came before them in their respective franchises. 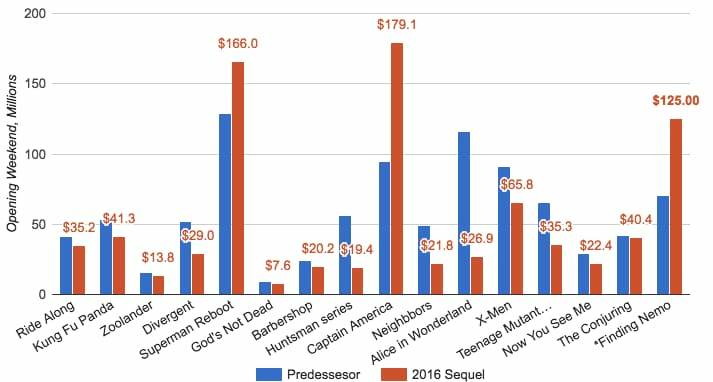 The chart below compares first-weekend domestic box office returns of 2016 sequels with their most immediate predecessors, with the addition of early “Dory” estimates. All widely released 2016 sequels appear in the chart, with the exception of “My Big Fat Greek Wedding.” (The 2002 original was a sleeper indie hit that opened in small number of select theaters, which throws a wrench in opening-weekend comparisons.) The second “Big Fat” still counts as a sequel bomb, seeing as it came in $180 million shy of the first installment. This weekend saw some reprieve from sequel sag, as New Line Cinema’s “The Conjuring 2: The Enfield Poltergeist” made nearly the same exact amount as the first one, which was a surprise hit. Could that have been the case with “Now You See Me 2” — which opened last weekend to $7 million less than the first installment made in 2013? But Disney also experienced the complete antithesis of the phenomenon, releasing the biggest box office moneymaker of the year so far: Marvel’s “Civil War” has amassed more than $1.1 billion worldwide. Disney-Pixar’s “Finding Dory” is sizing up to break the trend, set to obliterate “Nemo”‘s opening weekend when it opens this Friday. But there are more sequels to come, including “Rings,” Paramount’s third installment in “The Ring” series, due out in late October. And “Independence Day: Resurgence” arrives June 24. Without Will Smith returning (except for appearing in a photo), the film has an uphill battle to beat the 1996 original’s huge $96.1 million opening week (which was helped by a mid-week debut). With more sequels on the horizon, including “The Purge: Election Year,” “Ice Age: Collision Course,” “Star Trek Beyond,” “Jason Bourne,” and “Bridget Jones’s Baby,” there are a whole lot more followup films that are vying to break this year’s box office trend.